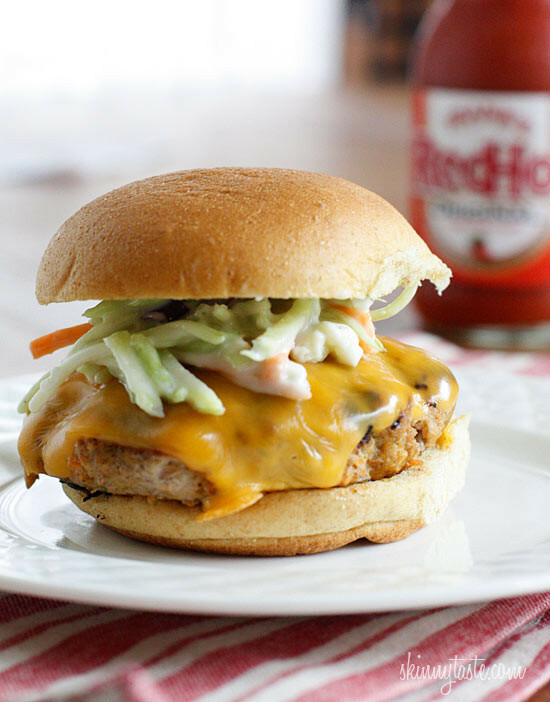 Turkey burgers with a cayenne pepper kick! 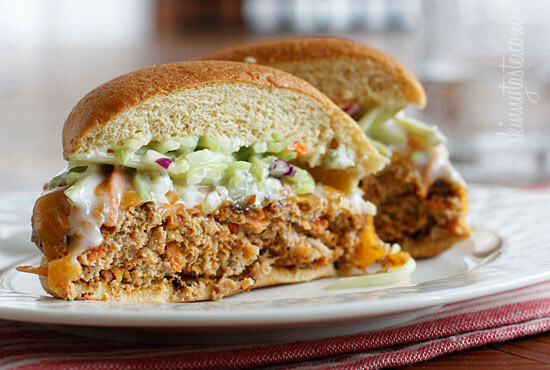 Here’s a fun way to turn boring turkey burgers into something with a little more exciting. 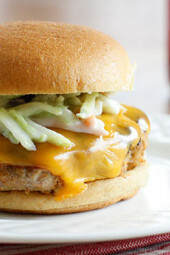 If you’re a buffalo wing fan, you’ll love the flavors in this turkey burger topped with a broccoli slaw tossed with my very own homemade blue cheese dressing. 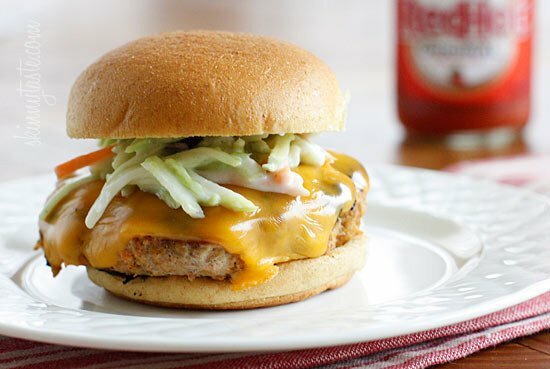 Someone recently emailed me and gave me this idea, she took my zucchini turkey burger recipe and dipped it in hot sauce after. I decided to add it to the turkey meat instead, and figured you can always serve more on the side if you wish! And by the way, there’s carrots in these burgers but I promise, you can’t even tell. It’s a great way to add more fiber and vegetables into your diet whether it’s for yourself or your family. I’m a bit of a wimp when it comes to spicy food, so Frank’s hot sauce is perfect for my taste, but if you really like it hot you could use Tabasco or your favorite cayenne hot sauce. 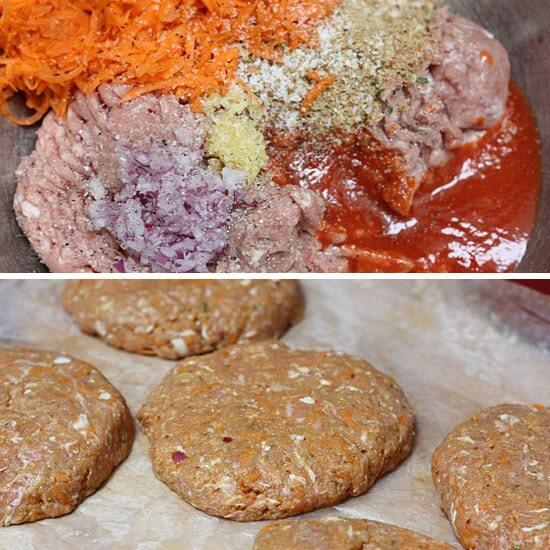 To make these burgers gluten free, you can sub the breadcrumbs for gluten-free oats. Freezer Tip: To freeze raw, place them on a baking sheet with wax paper in between, when frozen transfer to ziplock bags. To freeze cooked, you can fully cook them, then freeze in ziplock bags for quick meals; to re-heat you can microwave or thaw first then place on a skillet. In a medium bowl combine broccoli slaw and skinny blue cheese dressing. Set aside. In a large bowl, combine ground turkey, carrots, breadcrumbs, garlic, onion, hot sauce, salt and pepper. Makes 5 equal patties, 5.5 oz each. Heat a large skillet on high heat. When hot, lightly spray the oil. 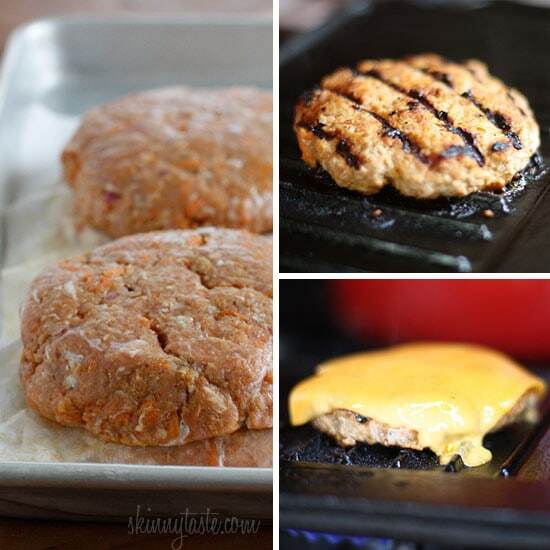 Add burgers to the pan and reduce the heat to medium-low. Cook on one side until browned 4-5 minutes, then flip. Cook another 4 minutes or until burgers are cooked all the way through (keep heat medium-low to prevent burning); top with cheese and place on a toasted burger buns topped with broccoli slaw. If grilling, clean grill well before cooking and spray with oil spray to prevent sticking.